Up until now, if you wanted filmmakers to look at your movie online, you simply posted a link to the Youtude or Vimeo page and crossed your fingers and hoped people watched it. For some, like Tom Ridgewell and his TomSka profile this was and is easy – but he, for example is one of Youtube’s rock stars with over two million viewers. But the game has all changed. Google labs developed a new search engine algorithm called Hummingbird which they launched on September 23rd 2013. Their goal? To make the search engine experience a great user experience. Hummingbird searches for content that is bright and fresh. As a filmmaker, creating content envelopes that draw audiences into your web becomes an important strategy to leading newbies to your work, and hopefully converting them into fans: people eager to read and watch the new work that you create. And eventually to pay for it too. For several year’s filmmakers played with Mark Zuckerberg’s toy. The thought was that if you had enough fans you would be able to get your movies seen. But wait a minute? Isn’t everyone trying to get more Facebook likes? And more Twitter followers? And more YouTube subscribers? It really becomes a self-defeating circus if every filmmaker is trying to get the same film fans on Facebook. A lightbulb moment! If you create interesting content and surround your films in so-called content envelopes, people will be so attracted to your social media profiles that they will keep coming back for more and more, and eventually start looking at your films. Let’s have a closer look at the key principles of film content envelopes. Here are the 10 commandments of film content envelopes. Making your film content memorable and sticky is a craft that has many parts. Here are the 7 principles to guide your content creation. The 7 principles apply to whatever type of content you are creating, be it a blog, sculpture, dance or movies. If you can weave some of these principles into your movies, your “content creation” then you are well on your way to awesome content. In the good old days (ie: pre 2008) one browsed bookshops and if a title of a book or magazine caught your eye, you pulled it off the shelf, skimmed it, checked the size off the text and the ratio of pictures to text. If you liked all that you saw, you walked over to the cash register and made a financial commitment to the content. Nowadays there is so much free content on the internet. If a headline doesn’t grab your attention, if the first line of a post or article doesn’t touch an emotional part of you, then that piece of content is discarded and we move on to the next one. We are capable of browsing hundreds of headlines and titles per hour. In this environment the skill at creating a headline or a title and tagline that can cause a reader to pause and hit a link in a mere nanosecond is the challenge. Whether your potential audience member is scrolling through a Facebook page, a Twitter feed or scanning the results of a Google search, you really have a microsecond to attract and then hold their attention. Learn the art of writing titles. Successful filmmakers know their audience. They understand their problems, their wants and pain points. Your film and the articles you surround it with need to be focused around that ecosystem of topics that provides answers, meets your audience’s deep desires and solves the customers pain. You need to keep the marketing content you create, the articles, blogs and posts that you surround your films with under very strict control. Always be asking yourself what it is like to be in the shoes of your audience. Is this something that they need to know? How will they feel when they see this? If you know your film and it’s topic, and if you are passionate about your film, you will know the answers to these questions without having to give it a second thought. We live in a time of intense media bombardment. when I travel to work on the tube, an average of 70% of my fellow commuter are glued to their cellphone, trolling through emails and other social media messages. I myself get several hundred email and other messages a day. At key moments of the day, I scan my email inbox looking for stuff which I won’t read and deleting it as efficiently as possible. The most basic mistake you can make with your own text based content is to create a giant wall of words and then challenge the reader to find the structure within it. These basic laws are there to make sure that the articles you are writing and surrounding your film content as as easy and distinctive and eye catching as possible. The internet is like a fluid. Ideas, articles, notices flow from site to site. They wash from Twitter to Facebook then splash over to Pinterest and slosh through LinkedIn. Your job is to make it dead easy to share. Make your social share buttons prominent even if you have to scream at your web designer. And make dead certain that the social share buttons display the number of times your article or content has been shared. Google has become a powerful tool. Nearly a third of the traffic to the Raindance websites comes from people who have stumbled onto our website as the result of a search. The trick is to make sure you make it really easy for search engines to index and search your site. These days there is no easy excuse not to do this. There are loads of free WordPress plugins like the highly recommended Dutch SEO product Yoast. Your movie and you yourself need to have a distinctive brand. I hope this doesn’t sound confusing. perhaps a better way to describe this is to state that each of your movies needs to develop their individual brand and marketing strategy. You as a filmmaker need to develop your ‘personality’ or personal brand. You will have to decide how closely you want the branding of each of your films to be associated with the brand that you are creating for yourself. filmmakers communicate using words and pictures. Pictures say a thousand words. Blend the text based articles and blogs you create with visuals: pictures and videos. You should find this relatively straight forward, though time consuming. You already have decided what the message is you want to send by writing them down. Same message but in a variety of formats. Here is something else you should consider: How people retain information. 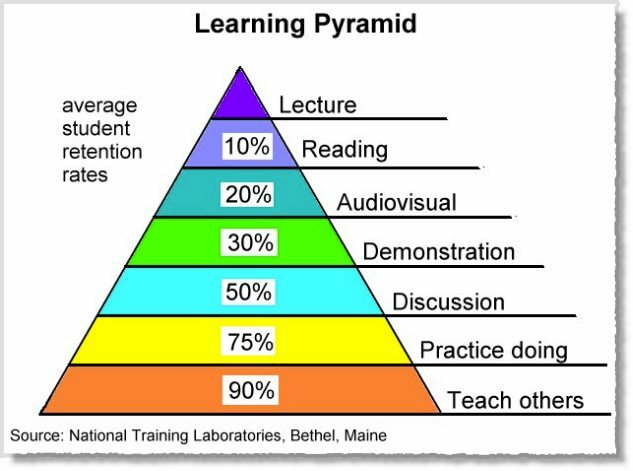 Here is Edgar Dale’s “Learning Pyramid” showing the increased retention rates when you involve multiple senses and multi-media. Create and publish videos, podcasts, images and infographics and that’s just for starters. Don’t forget whitepapers, ebooks and transcripts. Some like to read and others love to watch. Don’t rely on the same old same old networks you use all the time. i am really guilty of this myself. I will publish this post on our website and tweet and Facebook it out a few times. if I am really energetic, I will post a precis of some sort onto by much-neglected elliotgrove.com blog and maybe even upload a different version to my post slot on the influential Huffington Post. And then I will stop dead in my tracks. I should really be repuposing and be resubmitting this article on Youtube, Pinterst, LinkedIn. I should be getting guest blogging slots on influential filmmaking sites like indiewire and filmmakerIQ. And here’s the fact: If I found and took the extra time and put in the extra effort I would probably get ten times the readers. Youtube gets over a billion views a month. Geez! And the other fact is: The more people see you on different networks, the more it builds up their trust in you as a filmmaker and they are morte likely to rent or but t your movie or contribute to your crowdfunding campaign. Doing all this work without a goal is a waste of time. You need to decide a head of time what the goal of your overall campaign is. So, for example, you might want to generate more leads to add to your mailing list. If you want to, you could join the Raindance mailing list here. There are several techniques you can use for list building. One that we use is to attract people with a mouth-watering offer or reward and then hope they email a bespoke email account from which an auto responder sends the gift or reward. And we then have the email of the sender as well. For example, If you want a FREE list of all the short film distributors around the world, email download@raindance.co.uk. Another thing you will need to look at is the so-called landing pages people arrive at when they click your links. But landing pages is a topic I know nothing about, as a quick troll through the Raindance website should tell you. Is creating a series of film content envelopes for you? Have you got some more ideas of how we could do and/or explain this better? I look forward to your comments, suggestions and ideas in the comments box below.